Do you want some Juicy Fruit Dessert gum? Strawberry waffle I recently enjoyed at a restaurant buffet. Thanks to Wrigley Canada, I've been given the opportunity to try some new gum, 3 flavours to be exact. Before I get into the new flavours I thought I'd give a quick overview on other products that Wrigley sells: Wrigley's Excel, Juicy Fruit, Altoids, Starburst, lifesavers and Big Red are to name a few. Wrigley distributes to over 40 countries around the world. That is a lot of chewing! So back to the real reason why I'm writing this post. I'm here to talk about three new flavours Wrigley has introduced. 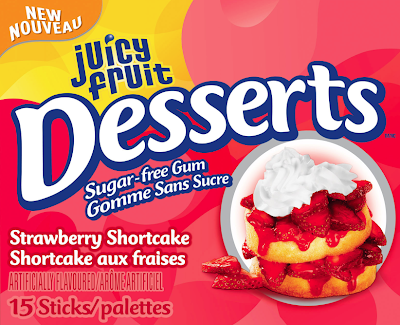 The trio of flavours are called the "Juicy Fruit Desserts" Sugar Free gum. The 3 flavours are Strawberry Shortcake, Orange Creme Pop and Apple Pie. Now the biggest issue with chewing gum is how long the flavour will last. To be honest I don't think any gum company has solved this long lasting flavour but life goes one and we all keep on chewing. I've tried all three flavours and pleasantly was surprised. The orange popsicle flavour brings back memories for me for some reason when I was a little kid. My favourite flavour of the 3 is the strawberry shortcake. I'm a little biased since I already love strawberries dipped in chocolate. Now I actually had an apple pie last night with maple ice cream from a restaurant called Joey restaurants and thoroughly enjoyed it. The down fault to eating these actual desserts is all the calorie intake. I think this is what makes the "Juicy Fruit Dessert" gum exciting. It's all the same flavours in the real dessert with less calories and no sugar. This makes sense to my waistline. So If you are looking for some new flavours give Juicy Fruit Desserts a try or enter my Twitter contest for a sample of each flavour of Juicy Fruit Desserts. 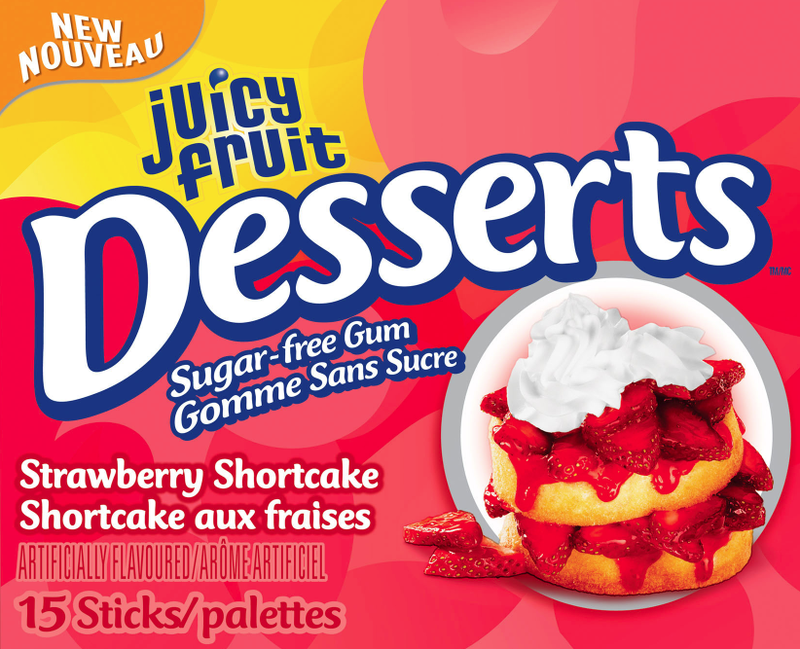 Tweet: " @clickflickca I want to try NEW Juicy Fruit dessert gum from @JuicyFruitCAN #JFDesserts "
Custom info on each t-shirt with Twitter handle. 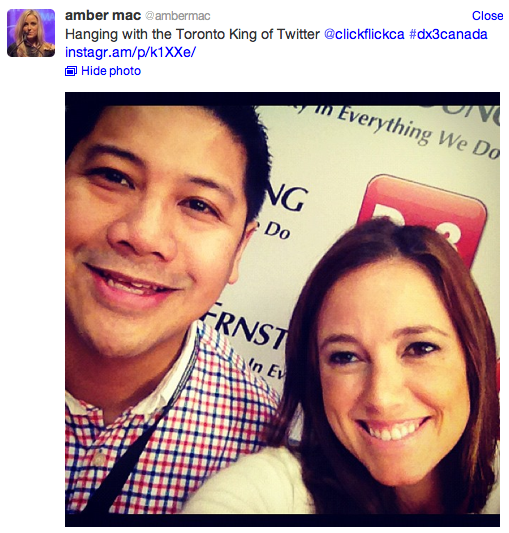 What is TdotTO? Back on December 15th I started a Twitter Fundraiser for 10 straight days until December 25th Christmas Day. I was going to giveaway 10 t-shirts to the highest bidder on Twitter every night at 10pm. I decided to do this fundraising because Twitter has given so much to me personally that it was my way of giving back to the community. I selected 2 charities dear to my heart with the Daily Bread Food Bank to feed Toronto locals and the Heart & Stroke Foundation. In the 10 days the Twitter community raised $1,260.00. This meant that each charity would receive $630.00. The Toronto Twitter community is truly amazing. There are so many good people and I commend those that made a donation to the TdotTO Fundraiser. I just received the tshirts recently so this is an update for you and those that donated. Unfortunately the process took longer than expected but it has been completed. The total amount has been deposited to both charities and everyone that donated shall receive a tax receipt for the full amount. Proof and payment will be showcased here as soon as I received final authorization. Tshirts will be shipped shortly. Proof of deposit to Daily Bread FoodBank. 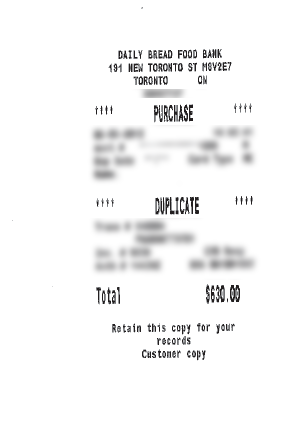 H&SF only gives a confirmation/authorization number so the proof of purchase will not be shown here until invoice arrives. This will be updated. The following are some of the donors: @rosalesj @avalen1 @iamjeffmiranda @ChocolaChocola1 @TaylorNVFerri @AcuraSherway @HotTorontoDeals This is not the complete list of people because they want to be anonymous. On a side note I also want to "Thank" Evoke Salon for donating funds to the TdotTO as well. On a final note, I've learned a lot from this experience and happy that we are able to give back to the community as a group. I look forward to doing this again in 2012. I'm also looking at trying to get the donation group together for a lunch/dinner so we can all meet up. If you have any suggestion please let me know. Thanks again to everyone including you for tweeting and reading this message. As I read a tweet recently on my stream, " Sometimes a small thing you do can mean everything in another person's life. " You've all made a difference so "Thank You". Three Years on Twitter. What a ride! I'll select winners tomorrow and mail out your vouchers. Thanks again for following and reading my tweets and this blog.